For nearly two decades, the Our Lady of Refuge/East Midwood Jewish Center Interfaith Committee has worked together to help educate our community about our culture and faith traditions. We have worshipped together at Shabbat services and attended Sunday mass including the Feast of Mary and the Feast of Our Lady of Guadelupe. We have hosted interfaith Passover seders, annual blood drives, supported the OLR food pantry and women’s shelter through donations, volunteers, and contributions, held interfaith square dances, hosted biennial Music of Our Faiths Concerts under the talented leadership of the EMJC’s Cantor Sam Levine and OLR’s musical director, Glen Balck, and have taken interfaith trips to the Museum of Jewish Heritage, Ellis Island, and interfaith walking tours of Coney Island and historic Brooklyn Heights. 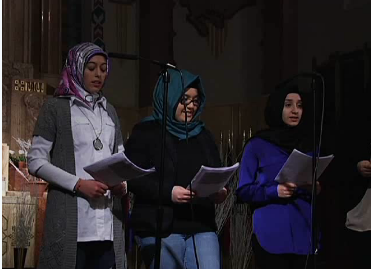 For the past 12 years, Our Lady of Refuge and East Midwood Jewish Center jointly hosted the annual Interfaith Thanksgiving Service. The service included prayers of thanksgiving from 10 faiths, clergy reflections, and musical interludes sung by OLR Spanish and English choirs, the choir of EMJC, Actorcor chorus, and Kingsborough Musical Society chorus. This year’s Immigrant Experience event featured congregants from OLR and EMJC who shared their personal stories, some in their native language, of what they experienced, what they sacrificed, and what it was like for them to leave their own countries and come to America. We look forward to continuing our work together, learning more about each other as friends and neighbors, and furthering respect and appreciation for our culture and faith traditions.